Sabrina Leung is an attorney practicing in corporate law and international business and trade law at CMKZ, firm that she joined in 2007. Her educational background in civil law and common law allows hers to serve her clients both in Canada and abroad. 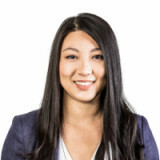 As part of her practice, Sabrina Leung represents and advises clients regarding several aspects of their business, such as overseeing corporate transactions, financing, private investments in private corporations, corporate reorganizations as well as mergers and acquisitions. She intervenes regularly on behalf of her Canadian and foreign clients, public and private corporations, in order to advise them in the negotiation and execution of commercial contracts, such as licensing, distribution and partnership agreements for products and services to be commercialized both in the Canadian market and foreign markets, notably in the sector of manufacturing and new technologies.